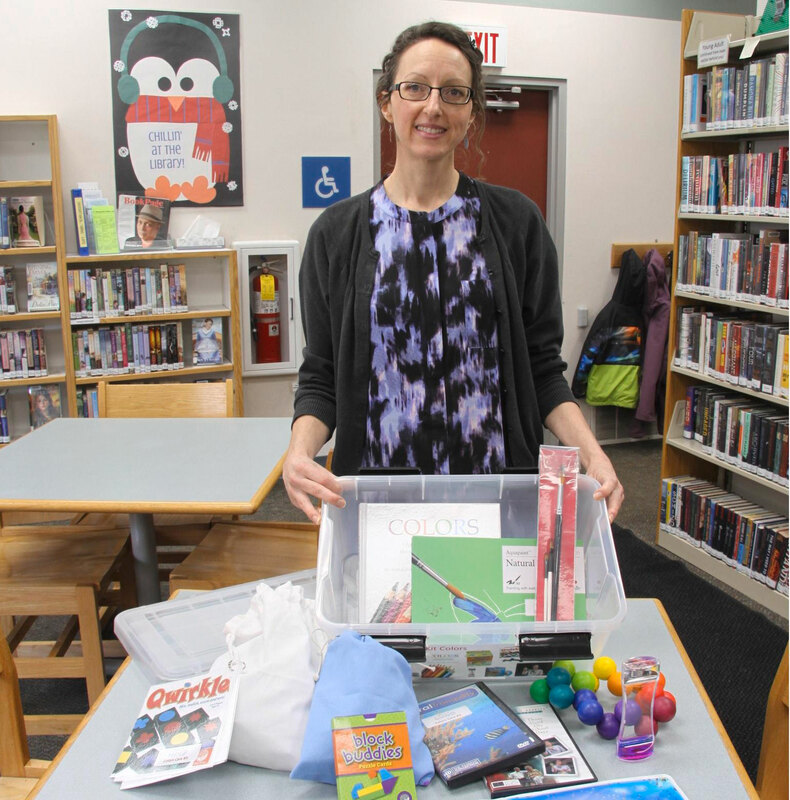 Journalist Sara Tischauser interviewed Ellsworth Public Library Director Tiffany Meyer about a new program to help carers and friends spend quality time loved ones with dementia. The results of that interview appeared in a recent Pierce County Herald (March 14, 2018). The themed caregiver kits are checked out in the same way one would check out a book or any other material from the library. Each kit contains a number of activities selected specifically for adults with dementia, memory disorders, or other cognitive issues. According to national figures, the prevalence of dementia in adults (over 18 years) in the US is somewhat more than 2%. This makes it easy to approximate how many of your potential patrons have dementia. Dementia Friendly America is a national network of communities, organizations and individuals seeking to ensure that communities across the U.S. are equipped to support people living with dementia and their caregivers. Dementia friendly communities foster the ability of people living with dementia to remain in community and engage and thrive in day to day living. There is still some confusion between “Alzheimer’s” and “dementia”, and the two terms are often used interchangeably. Dementia is a neurological condition that interferes with accomplishing everyday tasks and activities. Alzheimer’s is one of more than one hundred different causes of dementia. It is probably the most common; hence the confusion. Other causes include head trauma, stroke, and other diseases similar to Alzheimer’s. Dementia is sometimes called a memory disorder. People with dementia are often referred to as having memory loss. Memory problems are a part of most types of dementia, but memory is only part of it. Dementia generally affects other cognitive processes as well, including language and comprehension, perception, and spatial memory and navigation. Dementia can also affect executive functioning like reasoning, planning, and inhibitory control. As dementia progresses an individual will lose the ability to care for himself or herself. There are also behavioral and psychological manifestations that accompany dementia which can be disconcerting, even frightening. These may present as confusion, agitation, or even aggression. Very often these behaviors are attempts to communicate by someone who is losing the ability to communicate. These characteristics of dementia can make it challenging to work with affected persons. If you are considering creating a dementia friendly program it is important to learn as much as possible about the special needs and behaviors that you and your staff may encounter. Staff should be trained to recognize symptoms of dementia and ways to interact with people who have dementia. Ideally, there should be one or two staff members who have a personal interest in this population that can meet individually with patrons and care providers to learn about the program and help with material selection. Staff should understand the stage-appropriate & age-appropriate distinction and know how to address potential carer concerns about the appropriateness of certain activities. Lighting should be bright and even but not glaring. Shadows can be confusing and may even be misinterpreted as doorways or holes in the floor. Whenever possible use contrasting colors. Furniture should contrast with walls and floors, walls should contrast with floors. Restrooms should also offer plenty of contrast. A white toilet can be lost against a white floor and wall. Offer cultural and social programs in the library. These can provide a wonderful way to include otherwise disenfranchised individuals in the community. Art and music – Viewing art, including performance art, and listening to music are both highly therapeutic for people with dementia, as these activities are therapeutic for us all. Invite artists shows musicians to showcase their talents, as well s, will be a Creating art can be even more therapeutic. Art therapists and music therapist will take your dementia friendly library to the next level. Memory Cafe — a safe place for people with dementia to socialize and spend quality time.